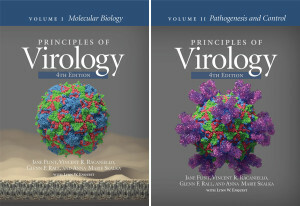 I am pleased to announce the publication by ASM Press of the fourth edition of our virology textbook, Principles of Virology. Two years in the making, this new edition is fully updated to represent the rapidly changing field of virology. 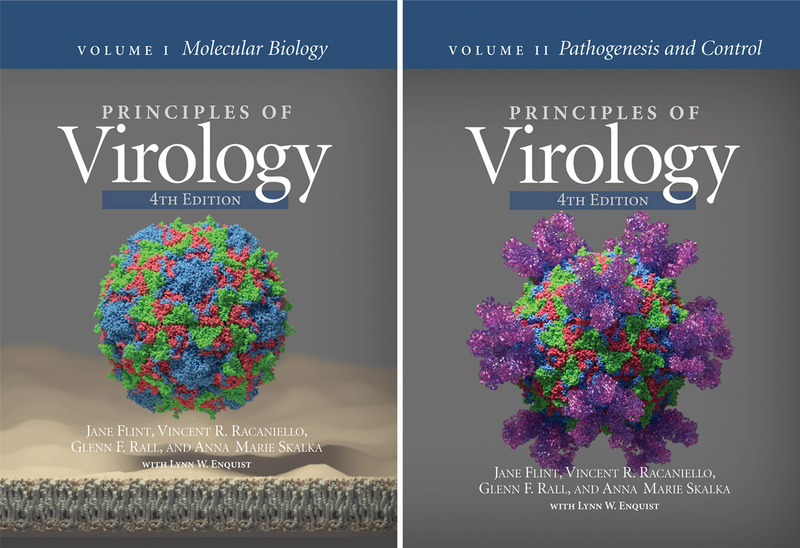 Principles of Virology has been written according to the authors’ philosophy that the best approach to teaching introductory virology is by emphasizing shared principles. Studying the phases of the viral reproductive cycle, illustrated with a set of representative viruses, provides an overview of the steps required to maintain these infectious agents in nature. Such knowledge cannot be acquired by learning a collection of facts about individual viruses. Consequently, the major goal of this book is to define and illustrate the basic principles of animal virus biology. This edition is marked by a change in the author team. Our new member, Glenn Rall, has brought expertise in viral immunology and pathogenesis, pedagogical clarity, and down-to-earth humor to our work. Although no longer a coauthor, our colleague Lynn Enquist has continued to provide insight, advice, and comments on the chapters. Principles of Virology is ideal for teaching the strategies by which all viruses reproduce, spread within a host, and are maintained within populations. It is appropriate for undergraduate courses in virology and microbiology as well as graduate courses in virology and infectious diseases. I have used previous editions of this textbook to build my Columbia University virology course. Volume I: Molecular Biology covers the molecular biology of viral reproduction. Volume II: Pathogenesis & Control addresses the interplay between viruses and their host organisms. The two volumes can be used for separate courses or together in a single course. Each includes a unique appendix, glossary, and links to Internet resources such as websites, podcasts, and blogs. PoV4 goes on sale the week of 24 August 2015. If you are thinking about using the book for your course, reserve your review copy today at http://www.asm.org/pov. Watch the video below to hear authors Jane Flint, Vincent Racaniello, Glenn Rall, and Ann Skalka talk about the making of PoV 4. Also, I love the cover art!! Both ebook and pdf versions will be forthcoming after release of the physical book. Not sure exactly when, but I’ll keep you posted. Any update on when the ebook is coming out? Are the figures available for teaching? I purchased the 2 vol set (New) from Amazon and assumed that either an access code or a disk would accompany the text so that I would have access to digital figures. How do I gain access to the digital figures? Should I have purchased a digital copy of the text instead?